Since its completion in 1974, my oil painting Standing Guard for Our Great Motherland has had a very strange fate. 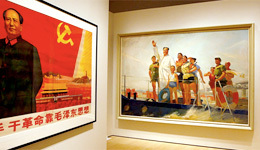 It has become somewhat of a cultural artifact, an embodiment of the narrative of the Cultural Revolution. To purchase tickets for all programs, call 212-517-ASIA or visit http://tickets.AsiaSociety.org. 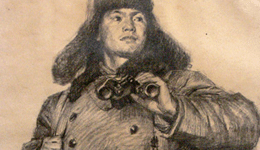 For further information and updated program listings, visit www.AsiaSociety.org. A series of documentary and fictional films examines the historical context of life during this tumultuous period in recent Chinese history. Check www.AsiaSociety.org for complete listings and schedule. Explore China�s relationship with the United States with former US Ambassador Richard Holbrooke and former US Ambassador Winston Lord, who was a key figure in the restoration of relations between the US and China in 1972. Moderated by Asia Society President Vishakha Desai. Art and China's Revolution Thursday, October 2 at 6:30 p.m.
Zheng Shengtian, exhibition cocurator, worked as an artist during the Cultural Revolution. He will discuss some of his personal experiences and the art created during this period. Guo Xiaolu in Conversation with Ian Buruma Tuesday, October 14 at 7:00 p.m. Author and prize-winning documentary filmmaker Guo Xiaolu, a finalist for the Orange Prize, will discuss her documentaries on contemporary China and her new novel, Twenty Fragments of a Ravenous Youth, with journalist and scholar Ian Buruma. The Shanghai Quartet and Friends Friday and Saturday, October 24 and 25 at 8:00 p.m. The Shanghai Quartet, known for passionate musicality, astounding technique, and multicultural innovations, will perform works created by Chinese composers who lived through the Cultural Revolution. Let a Hundred Flowers Bloom: Creativity and the Revolution Sunday, October 26 at 3:00 p.m.
Chinese artists from music, dance, visual arts, and literature discuss how the Cultural Revolution affected their lives and work. Wendesday, October 29 at 6:30 p.m. Although reaction to the Cultural Revolution and its aftermath was the political springboard for the reforms of Deng Xiaoping and China's vast economic growth, there is virtually no discussion or analysis of the Cultural Revolution in China today. How is the impact of the Cultural Revolution felt in China today? What are the positive-and negative-ramifications? Empty Tradition: City of Peonies/City of Paper Friday and Saturday, October 31 and November 1 at 8:00 p.m.
Choreographer/director/performance artist Yin Mei and Tibetan dancer Sang Jijia present excerpts from their earlier work City of Peonies, and their new work City of Paper. The evening dance program merges personal history, contemporary dance, visual art, and narrative drawn from Yin Mei's experiences during the Cultural Revolution. Covering the Cultural Revolution: A Conversation with John Burns Monday, November 10th at 6:30 p.m.
Pulitzer Prize-winning journalist John Burns worked in China as a reporter for Toronto's Globe and Mail during the Cultural Revolution. He will discuss his experiences with Orville Schell, Arthur Ross Director, Center on U.S.-China Relations, Asia Society. Dam Street, directed by Li Yu Friday, November 21 at 7:00 p.m.
Monday, November 24 at 6:30 p.m.
A conversation between Pulitzer Prize-winning photojournalist and editor Liu Heung Shing and Orville Schell, Arthur Ross Director, Center on U.S.-China Relations, Asia Society.